A record player is plugged in, uniformly accelerates to 45 revolutions per minute, and then is unplugged. 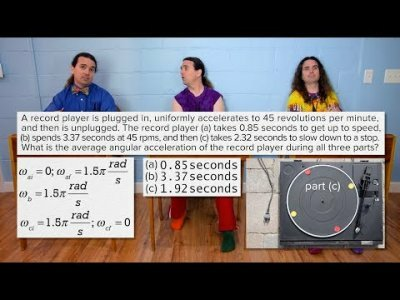 The record player (a) takes 0.85 seconds to get up to speed, (b) spends 3.37 seconds at 45 rpms, and then (c) takes 2.32 seconds to slow down to a stop. What is the average angular acceleration of the record player during all three parts?